First of all, thank you so much for all your sweet comments on the master bedroom reveal I shared last week! I mentioned in that post that I'd be sharing a tutorial on how to make the bench that my husband and I put together for the end of the bed. I meant to get it out sooner, but it's been a long week around here. The bench is a pretty simple building project that can come in handy if you can't find the right look or size of bench for the end of your bed, entryway, etc (or just want to save some money and build your own). MDF, Plywood Board (I used 5/8'' plywood that I already had) This can be cut to size at your local Home Depot or Lowe's. Step 1: Each 1" X 4" should be cut down into three separate boards. One 50" L board, 17" L board, and one 15-1/2" L board. This will provide you with the four sides as well as some extra support boards for under the bench cushion. 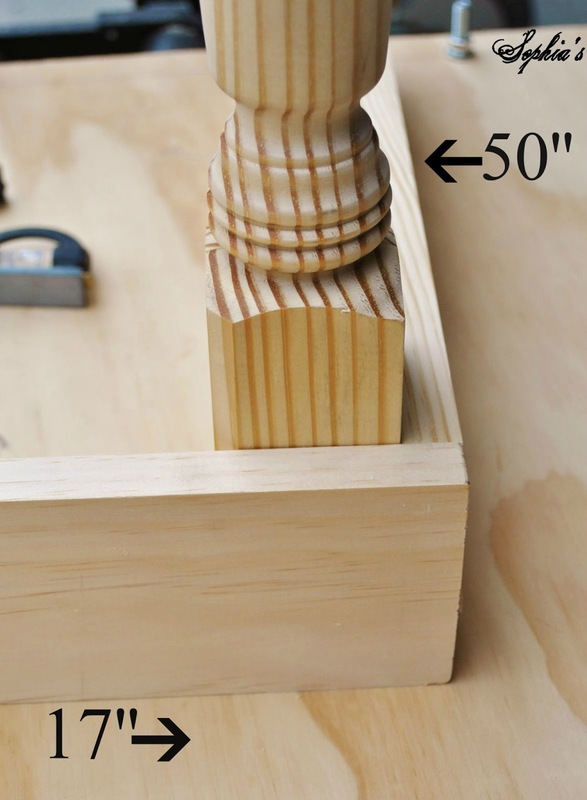 Step 2: Determine placement of screw pilot holes on your two sets of 17'' and 50'' boards to attach to the table legs. 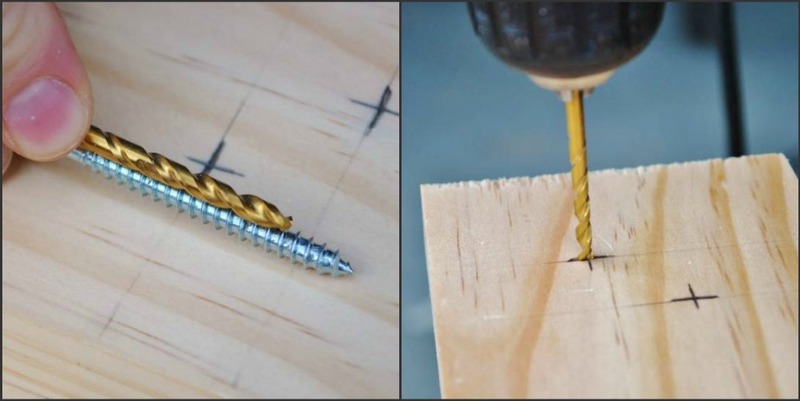 It is important to drill pilot holes so your screws don't split your board or the table leg. 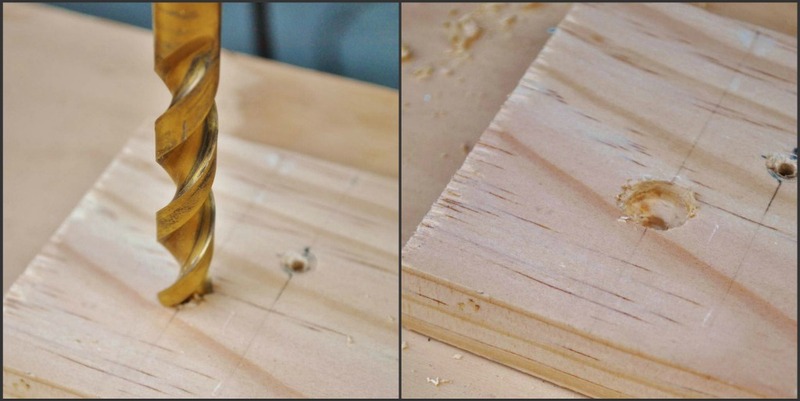 It is also important to offset (not line up) your screws to avoid splitting the table leg as well. Step 4: A counter-sink hole is also needed to hide the head of the screw and also to avoid splitting the board or breaking the head of the screw off as you attach the boards to the table leg. Take the 1/2'' drill bit and slowly drill a deep enough hole for the 1/2'' buttons to fit. Step 5: After drilling the pilot and counter-sink holes for all four boards, it's time to put together the rectangular box that makes up the bench seat. 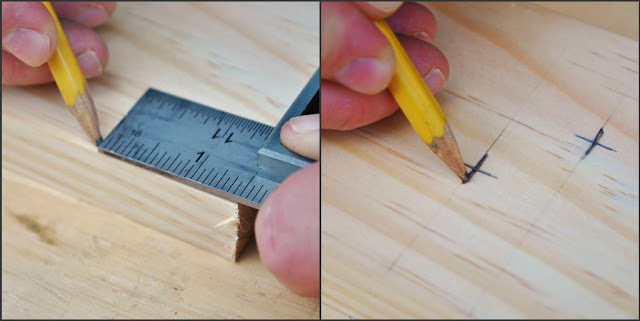 Using a right angle or Quick Square, line up the boards and put in at least two finishing nails through the corners to hold everything together. It definitely helps to have a second set of hands hold the corners while the other is nailing. 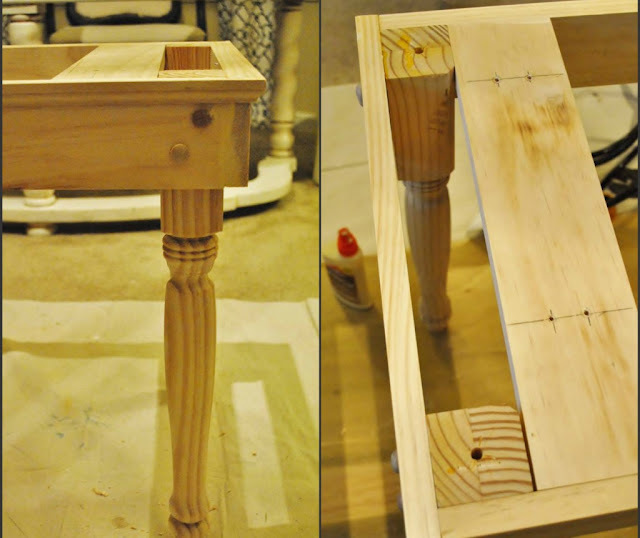 Step 6: Attach the table legs in each corner using the 2-1/2'' wood screws and cover the screw and counter-sink holes by filling them with the 1/2'' wood buttons (apply with wood glue). Step 8: Use wood filler to fill any nail holes, mitered corners, or rough edges for a smooth finished product. 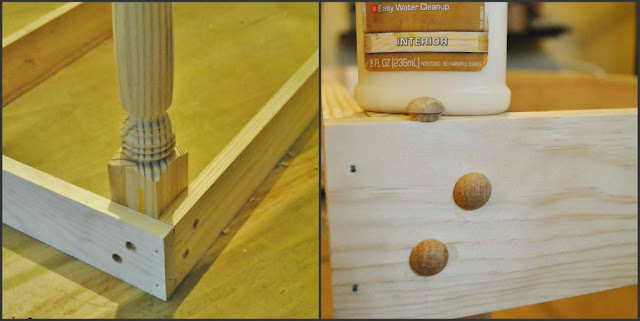 After the wood filler dries, sand, and apply your finish (stain or primer and paint). I used the wall color in my bedroom (a very pale blue-green) and added a hint of dark wax with the clear wax to seal. Step 9: Cut the MDF or plywood (or have cut at the hardware store) to size for the top of the bench. Measure and cut foam to size. I traced around the plywood with a marker and used a serrated knife to cut the foam. Step 10: To have smoother edges under the cushion fabric, wrap the plywood and foam with batting and staple it in place. Use your fabric of choice to then wrap around the batting. I usually do this in two steps, but it can be done in one. I also like to have a clean fabric edge under the cushion, so I simply fold the fabric under before stapling. Step 11: After upholstering the cushion, simply attach it to the bench by drilling the smaller (1-1/2'') wood screws through the pilot holes in the support boards shown in step 7 and you have your own custom bench! The bench is beautiful, Kristen! You did a wonderful job and are so handy with tools, something I'm not! lol! I really love the fabric...it all looks fabulous with your room decor! It turned out wonderful! Thanks for sharing your tutorial too! What a wonderful job you did--it looks fantastic! Wow! The bench is awesome! I have a tall bed so we would have to build something too. A fantastic tutorial! You did a great job! Very nicely done! I might give this a go...I can't find the perfect size bench anywhere! That is beautiful! I think you might just be my new favorite blog! :) Going to pin! Kristen...the bench is so beautiful...Thanks for the tutorial...It is wonderful that you can customize a bench for the perfect size you need....Great job!! I love the bench. I would love to make one at the end of my bed when I redo my bedroom in the near future. Your master is so pretty. Great job! Ok so the bench is beautiful, great job, but man the room is A-mazing. Hi Kristen, Thank you so much for the good info. I have been wanting a bench, and your's is lovely. Looks very expensive, beautiful job. Lovely bedroom. Love how this turned out - beautiful job and great tutorial! Great Tutorial! 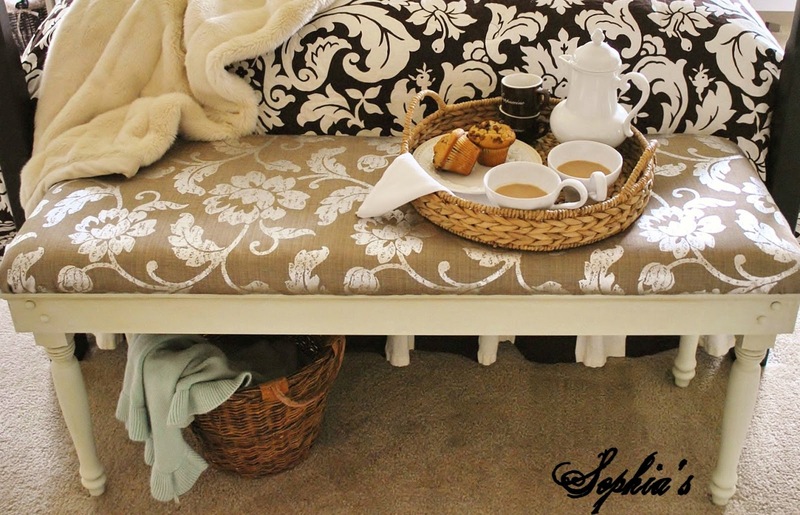 I wish I had room in my bedroom for a bench. I love it! We are also neighbors...well sorta - I live in the Charlotte area. As soon as I know the right place for it I will have to try that! Or maybe a little smaller. I usually don't have the guts to make furniture from scrap but I see that it actually IS possible. Wow! I love everything about this room. You did a fantastic job! I am a new follower- love your blog! Great job! Your bench is beautiful. Hello...I love your bench. Beautiful! I was wondering what the dimensions were. Width, and length particularly. Thanks! I love your bench! Beautiful! What are the dimensions of it? length and width particularly. I LOVE this fabric, where did you find it? ?